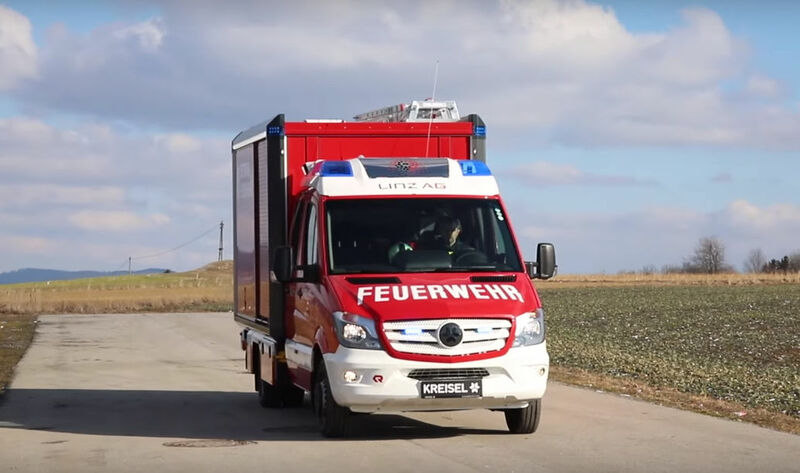 Kreisel Electric has developed the first fully equipped all-electric fire-fighting truck. Kreisel Electric in cooperation with Rosenbauer and Linz AG joined together two years ago to realize the vehicle. The basis for the all-electric fire truck was a Mercedes Sprinter. The vehicle was converted at the Kreisbach location Rainbach in the Mühlviertel. An electric motor with a capacity of 120 kW provides the necessary propulsion to move a maximum weight of 11,685 pounds (620 kilos). The battery can be charged via Type 2 or CCS. Recharging to 90 percent with an output of 50 kW will take around one hour and 20 minutes. The Europe’s first all-electric fire truck has an 86 kilowatt-hour battery weighing 620 kilograms (1,367 pounds) that offers an autonomy up to 100 miles (160 kilometers). The assumed mileage of 12,000 kilometers per year is expected to save around 4.8 tonnes of CO2 annually. Nevertheless, before the electric fire truck is put into operation, an appropriate driver training takes place.